The cycles of Saturn measure out the story of man. They rule the crystallization and de-crystallization of human structures. Saturn is the activator of beginnings and ends. Saturn never moves fast; but when it gets there, it always brings change. In 1981, when Saturn crossed by transit the natal Saturn of the U.S. chart (1776), an old group of politicians who had their hands on the levers of power for many years, left office. Another political party entered power. Franklin Roosevelt. Transits are for ascent to power as president. Click for larger. On March 4th, 1933, Franklin Roosevelt was sworn in as president. On that same day Saturn by transit was sitting atop his natal Sun. On January 20th, 1961, when Vice President Richard Nixon left office, Saturn was conjoined his natal Sun. 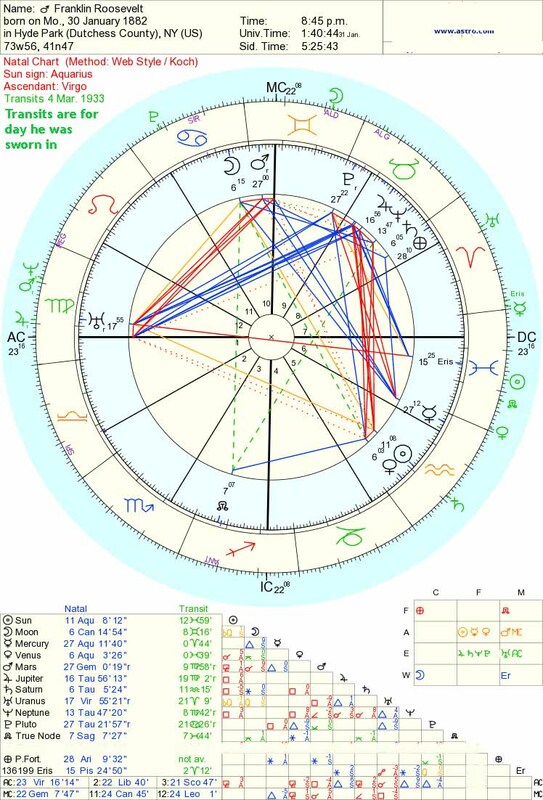 When Richard Nixon resigned as President, August 9, 1974, Saturn was exactly conjunct the natal Sun of the U.S. (1776 chart). It might seem strange that, in May of 1945, Winston Churchill would be voted out of office. Most will not remember who replaced him. On the day of the election, Transiting Saturn made an exact inconjunct to his natal Sun. Historically, inconjuncts rule upsets or reverses in elections. Founding and Fall of Soviet Union. Click for larger. In the Soviet Union, in November of 1982, the General Secretary of the Communist Party, Leonoid Brezhnev, autocratic ruler of the Soviet Union for nineteen years, spent a freezing day reviewing a parade in Red Square. This was a ceremony of the secular religion of communism that could not be avoided. He developed pneumonia and died. By the end of the month, when Saturn passed into astrologic Scorpio, a new leader, Yuri Andropov, was chosen. Andropov lasted till Feb. of 1984, when he died of kidney disease. Saturn made the conjunction to the Soviet Union’s Sun/Mercury, as the ruling politburo chose as its next leader, Konstantin Chernenko, an elderly and worn-out party hack. It was felt Chernenko would be the safest of all the candidates. When, in October of 1984, Saturn again crossed that Soviet Sun/Mercury, Chernenko fell ill. He survived for only six months, during which time the leadership of the Soviet Union continued its decay of upheaval and disarray. At Chernenko’s death 1985, he was succeeded by Mikhail Gorbachev, who announced two new policies: perestroika, or restructuring, and glasnost, or openness. Both of these philosophies and their implementation completely transformed that society. They led, inadvertently, whether Gorbachev wanted it or not, to the dissolving of the Soviet Union and the destruction of state Communism. Restructuring and change and the willingness to look at things in a new way are all part of the Saturn influence in history. The Saturn influence will always be present at the creation of the new. Examine every time a transit of Saturn occurs over a nation’s Sun or over a president’s Sun. Will there be a fall from power or an assumption of power? The answer is No. One must be very careful drawing conclusions about the present and future based on what has happened in the past. On August 9, 1974, an American president resigned in disgrace. This was when Saturn was exactly conjunct the Declaration Sun. On June 5, 2004, Saturn was again conjunct America’s Sun. The president at that time, was George Bush II. He neither died nor was driven from office. Over the years, I have read numerous predictions that a president would die in office, would be hounded out of office, etc. They have all been wrong. They were basing their judgments on a dreary mechanical reading of the past. It never works that way. Astrology in its fusion with psychology has risen to a high level of development. This merging of astrology and psychology is perhaps one of the greatest achievements of astrology in the twentieth century. There has been a far less combining of astrology with the disciplines of history. The influence of Saturn is subtle and varied in its effect on the human condition. If one wants to understand the influence of Saturn on current history, then the meaning of the events of that period of history need to be as mastered as well as or better than the discipline of astrology. When Saturn crosses a nation’s or a historical personage’s Sun or Saturn, all one can say in certainty, is that the structure, the form of the executive power will somehow change. Sometimes, changes are so interior, occur so deeply within that personage’s mind, it is difficult to detect anything on the surface. 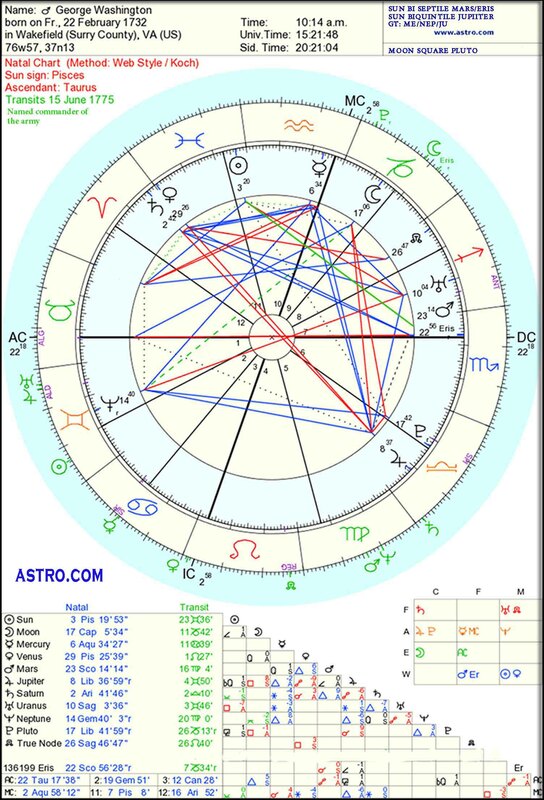 When Harry Truman was sworn in as president in April of 1945, Saturn was at 4° Cancer, atop America’s (1776) Venus/Jupiter conjunction (Declaration Chart); in two months, by the end of June, 1945, it was on America’s Sun (Declaration Chart). Truman didn’t go out of office; he didn’t die; but the composition of presidential power did indeed change. When Saturn began to conjunct America’s Sun, the new president began forming his own staff, gathering around him in the White House those that he knew and could trust; he instituted his own way of doing things. As a timer, a marker of events, one could say that this transit of Saturn indicated the beginning of the era of pax Americana. With the exception of local wars like Korea and Vietnam, there were no world wars. America reigned supreme on the planet for the next thirty years. On September 1st, 1939, Hitler’s legions invaded Poland. This date is the formal, traditional date for the beginning of World War II. Hitler often employed astrologers to advise him in his political and military exploits. On that day transiting Saturn sat right on top of his natal Sun. This aspect (the conjunction of Saturn to his natal Sun) often indicates a rise or fall in power. As an astrologer examining the influence of this Saturn, would you have been able to tell which way the war would go? As far as I know, not one astrologer was able even to predict the onset of World War II. In the beginning of the war, appearances seemed to support a rise in power for Hitler. His astrologers gave him for Sept. 1, 1939, a Grand Trine involving Mars and Uranus, and his war victories were easy and final in the beginning, but that Saturn on his natal Sun remained, and it was conjunct the Line of the Nodes in the World War II chart, and by the time it transited over to Pluto of this chart, it was total disaster. This was a declaration of war by Germany on two nations that had defeated it twenty years previously. Then a year and a half later and two years later, he made declarations of war on Russia and America. Hitler turned this into a war on two fronts, located in the West and from the East, and by the time America formally entered the war against Germany, it would take three years and eight months to totally crush the Nazis. To detect an influence is an easy matter. A year or two of training in astrological discipline will enable anyone to know when an important Saturn aspect is coming. To understand what it means, what it is going to do, takes infinite pains. One must look deeply into the historical process. One of the most important battles of the American Civil War was fought at Missionary Ridge in Chattanooga on 25 November 1863. The power of the Confederate Army was destroyed in this battle. Never again was the Confederacy able to defend itself against an invading army. Though it took another year and five months for peace to be concluded at a courthouse in Appomattox, Virginia, many historians feel that the Civil War essentially ended at Missionary Ridge. The North cheered, and Sherman’s March brought Lincoln a second term by a large popular vote. This Saturn Return influence assisted in wiping out a political structure that had allowed slavery. All the astrologer could honestly have predicted at that time was that there would be new structures in the exercise of power in America. Cycles of Saturn: Can They Be Used for Prediction? Prediction is a lost art—the Sumerians might have had it, and perhaps the Chinese, the Vedic astrologers, the Greeks, and some others. The way prediction is practiced today makes its practitioners look ridiculous. It should be used very carefully by serious astrologers, or perhaps not at all. George Washington Appointed Commander of Continental Army. Click for larger. When Saturn conjuncts or opposes a natal or national sun, one can say with a fair amount of certainty that “change” will occur. A king may die, as in the execution of Charles the First of England (Saturn opposed his natal Sun). Or one may simply have a bad year, as did Eisenhower in his last year of office. He was verbally attacked by Premier Khrushchev and had to deal with the U-2 spy plane incident and other issues that made him look weak, when Saturn transiting at 13° Capricorn opposed the Declaration 13° Cancer Sun (1776). Mostly, with Eisenhower, it was the universe telling him that it was time to lay down the years of supreme power exercised by very few in history. And he did this with grace. In other historical situations in the flow of time, the Saturn opposition can represent an ascent to power, as it did with George Washington, when he was appointed commanding general of the Continental Army, and transiting Saturn was exactly opposing his natal Saturn. Or the on day, Jan 20, 2017, Donald Trump was sworn in as president: transiting Saturn opposed his natal Sun exactly. It is a simple affair to note the saturnine influence, but to interpret it is a process that will only work after deep study of history itself. Many serious students of history feel that one cannot understand the truth of a situation, or of a series of events, until a certain amount of time passes. A generation has been measured at approximately thirty years, one complete orbit of Saturn around the Sun. Often a generation must pass before classified files can be opened, private letters read, the major actors in the drama interviewed. Sometimes three generations must pass before the truth of a situation is understood. If one is a serious student of history, and knows its people, its laws, its customs, its formative events, etc., then one might hazard an educated judgment as to what might possibly occur. The astro-historian must know and understand, feel and be at home with all those influences surrounding a historical personage or a civilization. In the trial and execution of Charles the First of England, the Saturn opposition signified the end of the king’s life. The transit described a falling apart of the power he had never learned to use. His chief interest in life had been aesthetics and beauty, and he was known as one of the finest connoisseurs of Renaissance art in Europe. And even then he or she can be wrong. Saturn, as it affects the flow of history, is the agent of karma, time, and change. We are all subject to the Laws of Grace (love) and to the Laws of Karma (balance); Saturn is one of the archetypal energies configured in the solar system that functions to keep the doings of the human race in balance. For example, when the Iraqi dictator, Saddam Hussein invaded Kuwait (August, 1990), the powers of world arose and told him he must withdraw. He defied these powers and ended up losing his army, his economy, his pride, and much else. On the day of the invasion of Kuwait, Saturn opposed his natal Sun (his time of birth is unknown). What happened to Saddam is typical of the Saturn opposition. In world affairs, if energies exist which have been “misused”, this opposition can represent a time of “falling apart”. If group energies have been used ethically, this aspect can represent a successful culmination of group efforts. When viewed from a world historical level, Saddam Hussein simply experienced a balancing of collective karmic forces.For more on Saddam Hussein, go here. As the facilitator of change, Saturn rules the process of crystallization and its opposite, de-crystallization. Saturn rules both phenomena: the building up of structures, ones that are hard and strong, that endure, and the collapse of what is old, what is no longer useful. Saturn is the timer of beginnings and ends. When President Roosevelt took the oath of office for the first time on March 1st, 1933, Saturn, the arbiter of beginnings and endings sat right atop his natal Sun at 11° Aquarius; it was working as the planet of change. When Dwight Eisenhower was elected President in Nov. of 1952, Saturn sat on his natal Sun at 20° Libra. We could go on and on through history citing examples showing how Saturn works as the timing agent of change. When Roosevelt entered office, a whole new group of people came into power, and a new philosophy of government was born. In the presidential election of November 8, 1960, when Saturn was within a degree of opposition to the natal Declaration Sun (13° Cancer), when Kennedy and Johnson were elected, the same restructuring occurred—different people entered office to govern, and they brought with them new political philosophies. Does this mean that when the new faction came into power that they governed any better? No, I don’t believe we can make a value judgment like that; all one can say is that change will occur, the old structures of governance will collapse, and new ones will be built. However, some forecasts can be made. During a presidential election, say that one candidate has a Saturn conjunction on his Sun and the other doesn’t. One might assume that the candidate with the Saturn/Sun will have the mantle of power draped over his or her shoulders. Yet again, the Saturn conjunction was an ascent to power aspect for Roosevelt, but not for Richard Nixon, who had Saturn conjunct his natal Sun (21° Capricorn) on Jan. 20,1961, when he went out of office as Vice President. Yet for both historical players Saturn acted as the agent of change. Other Saturn combinations should be examined (see The Conjunction of Jupiter and Saturn in America’s Chart), but the Saturn conjunctions and oppositions will always provide a rough rule of thumb in judging the direction the historical process will take. At times, the historical change will be quiet; then, in other Saturn transits there will come a dramatic, obvious historical occurrence.